If you have the Ruger Blackhawk you have the western (plowhandle) grips Eric is talking about. They are designed to roll up to your web when you fire to asist the thumb to reach the hammer better. The Remington bullets I use for my .38 Specials and .357 magnums are just that. Remington 140 SJHP bullets. Now we're talkin'...I have a Browning A-bolt in .30-06 and load Sierra 180 grain BTSP and 165 grain BTHP over H4831SC. Bushy, just because I have pics of me in my Confederate uniform doesn't mean I'm old... Does it? guess Ill have to go surfing to discover more. So i am sure that the conversation has shifted away from the .338 Win Mag by now but I wanted to put in my two cents. First of all, I rather like the cartridge and it is the most popular in Alaska. Second I will say that it is not overkill for deer sized game if that is what you want to kill with it. I have shot several but never hunted with them. I do have a friend that hunted for years with one and he said it was dumb to hunt with smaller calibers because the bigger ones do a better job. I call bs on that statement as far as hunting deer. He shot a deer and the damn thing ran 140 yards before it stopped and he immediately said he needed a bigger gun. Since then he has come to his senses and is now hunting with a 300 Win mag. So the myth that deer don't run after being hit with something that big is dead wrong. Its all about shot placement and even then a well placed shot does not mean the deer will not run. I have shot them in the heart and had them drop in their tracks and I have had them run with the same shot. Almost only way to 100 percent guarantee they will not run is to break their back or neck. Not saying that you need to but its true. I will continue to shoot them in the lungs or heart unless a neck shot is available. With that being said If i were to hunt deer with one I would definitely tune it down and make it a more pleasurable cartridge to shoot. For now there is nothing that I hunt that I cannot easily dispatch with my 7 mag so I will stick with that. If i get the chance to hunt moose or the big northern bears then I may pick up a .338 win mag or maybe a 325 Win. Any how best of luck to you and welcome to HN. Bushy, did you mean the 338/06? I can't find any info on a 340/06! Corrected to .30-06. Never seen such a fuss over a "fat finger" error, but I AM on the huntingnut. 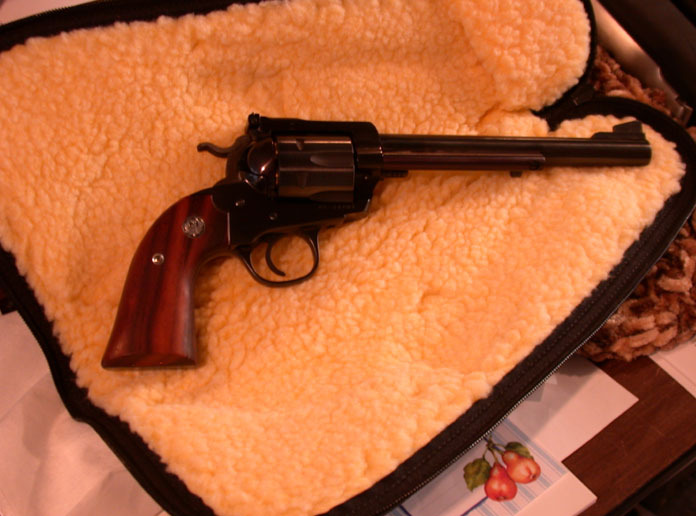 Eric / Bushmaster, Not sure but I was thinking the Pachmyers on the 357 might be more comfortable on the wood the 44 has. The grip panels on the Blackhawk are the western or plowhandle grips. Pachmyer grips are good on all heavy hitting handguns. My wife has them on her light hitting Mod 10 S & W 2" .38 Special. The original 338 query did get sidetracked but all is good. If I'm not mistaken, it was originally developed for Alaska. I have a few friends that hunted "up there" and commented on being able to drop the rifles in the horse trough at the end of the day to de-ice them, wipe em down with oil so they'd be ready for the morning. Not for me brother...too damn cold for me but I saw their rifles when they returned. once cleaned again appeared as they just left the store. All were Rugers M77's in stainless. THAT I admit made a believer out of me so when I could, I bought a few. Your spot on about shot placement though. I am in the process of de-tuning this down to below 30-06 only because of the area here. There in ( if I remember correctly ) Missouri?, you probably have a stretch to work with + or - the vegetation. Here ( compared to Arizona ) it's like hunting in your (large) back yard. Maryland was the same way. Last I hunted there, someone from across the ravine shot at a dog that was only some 30ft from me. Not my dog but just there & curious as to why I was there. Friend of mine does black bear in Maine with a 7mm08 very well every year. A 7x57 mauser will take a moose better than a 6.5x55. Personally, I'd try either but like you, might "feel better" with a 338 pointed his way ( in case he gets pissed ). Thanks for the welcome to HN. Thanks for the education Bushmaster. 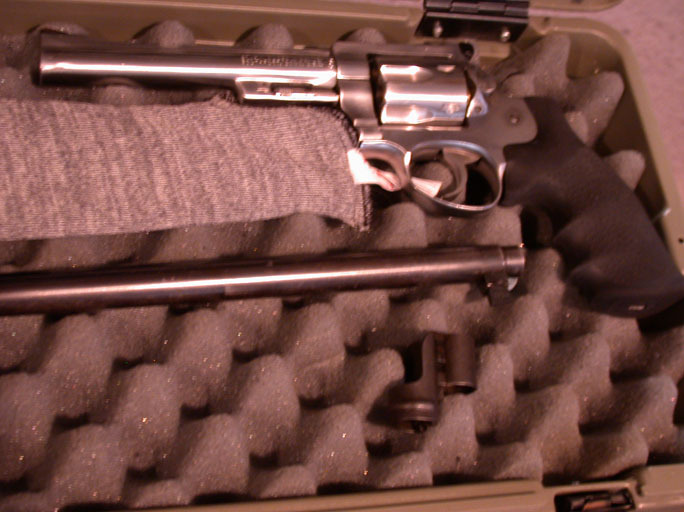 Never fired this one w/357's after the new grips but probably would have liked it from your description. The other 44 I "had" had the straight backed trigger guard. Folks warned that guard would hit hard so I never fired that one either. When I get Pachmyers for this one, I'll give it a try. Appreciate your insight on this. John, I use 357 mags in my Security-Six 99.9% of the time. The two loads that were the most accurate in my gun was the 19.1 grain of H110 and a lower load of 18.0 grains of H110 both with a JHP 140 grain bullet. Once in a great while I will shoot wadcutters at 750 fps from it but I stick with what shoots well. Thanks PaulS, I will log this info in for reference for my 357. Loading my own is certainly going to begin a new experience / relationship with this Ruger. Better shot versus bigger gun, slow and heavy versus light but fast., single shot versus double digit magazines, the discussion goes on with pros and cons to each position. In my simple mind the rifleman's shooting skills combined with good ammo and an accurate rifle of reasonable calliber for the game hunted are the winning ticket. So what about the one rifle hunter who wants to hunt everthing from antelopes to big bears? Get a 30-06., pick a quality HUNTING bullet of appropriate weight and then load to your rifle's sweet spot. Most importantly, practise shooting at various ranges at targets that approximate the kill zones of the intended game. Rifles are not proximity weapons. To the original poster, IMHO based upon my own experience with deer, that rifle is overkill for whitetails unless you load it down.